If you're not used to seeing the 'low on internal storage' notification, what is it that you're doing to keep your phone's internal memory from filling up so quickly? The 'SD Card and Phone Storage' menu in the settings doesn't really tell me much other than how much is free. And, I don't really have that many applications installed. The top 5 storage hogging apps on my phone are Gmail (18.6 MB), Twitter (17.5 MB), Facebook (12.55 MB), Maps (9.63 MB), and Swype (6.06 MB). So, are there apps out there (besides your normal file manager ones, like Astro) that will help monitor internal phone storage? Is there something I should be doing to keep my phone storage use to a minimum? 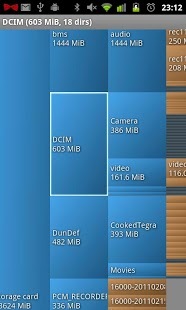 I'm using an app called DiskUsage which helps visualize what's using both my internal storage as well as the SD card. Most of the apps you have listed are big because they are storing data. The apps themselves are not that big. I would encourage people to check large apps (you can sort by size in the manage applications area of the settings). Chances are you can clear out the data and reduce the amount of size very easily. Most of the data for those apps especially is email and data that are old and don't really need to be on your phone. To better control your Gmail storage in Android you can adjust the number of days that are synced. The control is in a place many people don't think to look; it is in the "Labels" section. In there you can adjust syncing to a certain amount of days; I use 2 days. Depending on your daily volume you may need to go to 1 day or could go up to 10. There is also granular control, you could keep your starred emails around for 4 days while everything else is at 2 days. It is all about Gmail's label setup. It is better to think that you don't really have an inbox, you have emails that are labeled "inbox". Hope this helps out! Once you make the change it will sync up and reduce your storage right away. I recommend turning off and on the phone after making the change (just like a computer, the Android phones like a reboot from time to time). I am great fan of APP2SD. It comes directly with an advice which apps can be moved to your SD and if the cache can be removed! DiskUsage is excellent at locating "resources" that may be taking up lots of space, and may be even be left behind when the app that downloaded them is uninstalled. But if you have lots of small to medium sized apps installed, or if you're using many apps that stay online, Link2SD allows you to quickly locate any misbehaving one. It shows you a list of all installed apps, and allows you to sort them by name, install date, install size ("apk+dex+lib" option), data size, cache size, or total (install+data+cache) size. If you have many apps showing a lot of cache usage, Link2SD can also clear all of them at once with the "Clear all app caches" option. Also, if you're using Gingerbread, be aware that apps moved to SD card keep a part of themselves, called "dex", on internal memory, and the size of this "dex" varies from one app to another. With Link2SD you can sort by "dex" size, and quickly find any apps that may be too big to keep installed on certain phones, even if they allow moving to SD (I'm looking at you, Google+ client). Or the other way around, you can sort by "apk" or "lib", and move to SD all apps that show near the top (and allow being moved). You can also choose to replace the default GMail app with the K9 mail client - the main plus point being it can handle other POP3/IMAP4 accounts as well as keep the storage for your email accounts on the SD card - this option does make it a little slow for first access, but if space in your internal memory is at a premium, then this might save space. That would obviate the need for a client app. WRT Swype, if you prefer other ordinary keyboards, there are a plethora of them available in the market like Better Keyboard / Smart Keyboard etc. which are far smaller in size, but certainly don't have Swype's functionality. Re: Twitter app. Unless something has changed in it (it's a couple of versions since I used it), it stores all its cache in "data", which you can clear out by going to "manage applications" in settings. If you do clear out all the data, you'll need to open the app and log back in again. Other apps, eg TweetDeck, have this stuff more easy to clear out in a "cache" section, but Twitter doesn't do it properly. Either clear your dalvik-cache, install a custom rom (like cyanogen) or force apps to your SD card with an app called 'LinkApp2SD' (I had to reformat my tab because of this one, but it should work if you're rooted and have a G-certified phone). Also, if you don't want to root your phone, you can try cleaning your app data and cache, or even uninstalling apps you don't use anymore. See my website's blog to find cool apps and games that can be moved. I have used the previously mentioned Disk2Usage to take a look at what's eating up my data. What you can do depends on what your device is. If you have an external SD card in addition to your phone's internal storage, you can periodically move data over. For example, my camera takes pictures and stores them in the internal storage. Since my phone (an Epic 4G Touch) has an 8 megapixel camera, those pictures can get pretty big, so I'll occasionally move all of my pictures to the SD card when space runs low. I've also noticed that a lot of programs cache data in the internal memory. I've seen photo apps that cache thumbnails, and even Amazon's App Store caches the entire app APK for any apps you download from that store. This can take up a lot of space, and is generally safe to remove, since, if the app needs it, it can re-download it. I use the above Disk2Usage app to find the large cache directories, then use a file manager app (like Solid Explorer) to delete those cached files. In the manage applications area of the settings, select apps that you dont use. 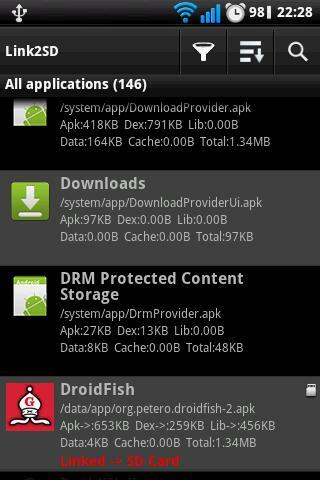 Uninstall these apps if possible, if not the following method will greatly reduce their size. Force close, clear cache, clear app data, Uninstall updates, disable. This also prevents them from growing again. Also in android 4.x, the function of apps that write to sd are broken, only android itself eg. through the file manager has that permission. Additionally while many of the apps above look great, they will take some space. I'm posting on a Galaxy s5, but many older devices don't have 16gb of storage space to play with. I would however recommend a good cleaning app that detects app leftovers and removes them as well, and of course if you decide to stop using such an app you can Uninstall it, it has already served it's purpose. Also ALWAYS move songs, ring tones, pics, etc. to the sd card. I just received the dreaded out of space notification and used Memory Map, which was very helpful in finding what the issue was. Tap the buttons to "clear cache" and "delete data"
Press the "Disable" button. See our disable-app tag-wiki for some background on this. If at any time in the future you want one of those apps back: Go to the very same place. You won't see a "Disable" button there anymore: Aftger you've pressed that during above process you will have noticed it's now labeld "Enable". Press that. The app will be re-enabled and available, and its updates will start flowing in again as well. Not the answer you're looking for? Browse other questions tagged internal-storage insufficient-memory or ask your own question. Android tool to find what's taking space, and delete it? why does my tablet say insufficient space? An app that can give a clear overview of what exactly is eating up my phone space? I have low internal Storage, But i have no apps on my phone? Low on internal data storage - looks like the some apps use a lot! How can I fix internal storage growing for no reason?